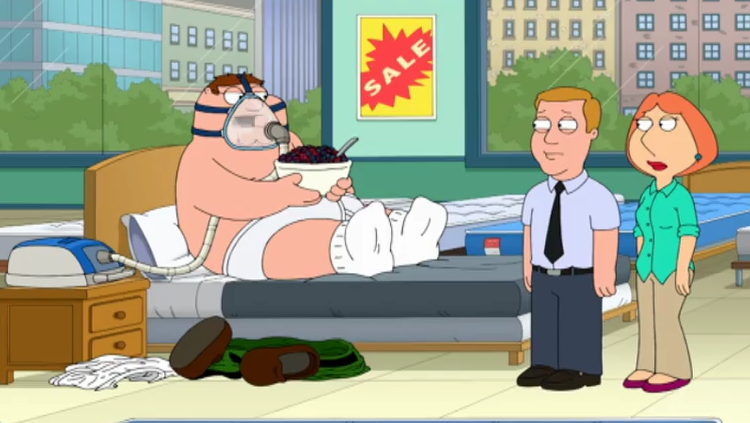 To celebrate the release of Season 16 of Family Guy on DVD, we’ve got an exclusive ‘deleted scene’ that never went to air to show you. Seth MacFarlane’s iconic cartoon series is full of politically incorrect jokes, ridiculous flashbacks and no-holds barred comedy, so predictably this ‘Mattress Scene’ is a treasure trove of absurdity. The clip comes from episode three of Season 16 – titled Guy, Robot – and surrounds the topic of internet shopping. Peter and Louis head into a store to test out a mattress, which Peter quickly desecrates, before Louis buys the mattress on Amazon anyway. Getting your hands on Family Guy’s 16th Season DVD gets you access to even more deleted scenes, episode commentary, as well as other bonus material about the Art of Family Guy and a special Full Episode Animatic. Check out the full deleted ‘Mattress Scene’, below.